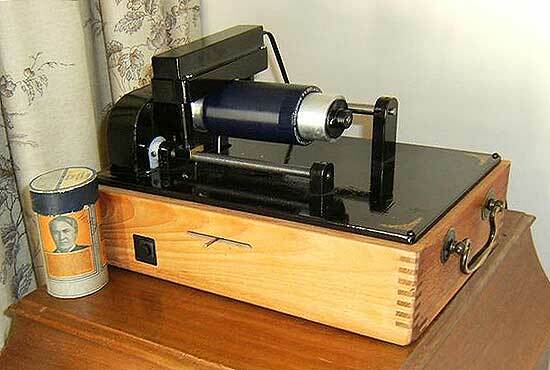 A year ago I managed to pick up some old Edison cylinder records from a local antiques centre. They were of the four minute Blue Amberol type. I initially bought them as nothing more than a curio but later wondered how difficult it would be to play them. A quick look on the internet soon showed me that at �0 to �0 for anything like a half decent original player was well out of my league. So clearly if I wanted to hear this long lost music from these cylinders I had to make some sort of player. I toyed with many designs over that Christmas involving using a standard pivoting tone-arm or converting a Akai record deck I have with linear tracking. Deciding that a pivot arm was not ideal and converting something designed to do a specific job was complicated, I followed that old engineering adage�"If it ain't broke, don't fix it". One has to admit that by the time Mr. Thomas Edison had drifted away from cylinder records and into the d.c. electricity generating business, he'd got the technology pretty well sorted out. A technology that was still used in some office environments well into the 1950's. In fact, I myself even recall seeing during the early 1970's in one of our stationery cupboards� and despite whatever else went on in there� an unopened case of wax cylinders for long since discarded Dictaphones. The design of machine I settled upon is restricted to only playing the Blue Amberol four minute type cylinders, the groove of which as all here know is cut at a pitch of 200 per inch. For the lead-screw I chose a length of 3/8" BSF (British Standard Fine) steel stud-bar that has a thread count of 20 tpi. 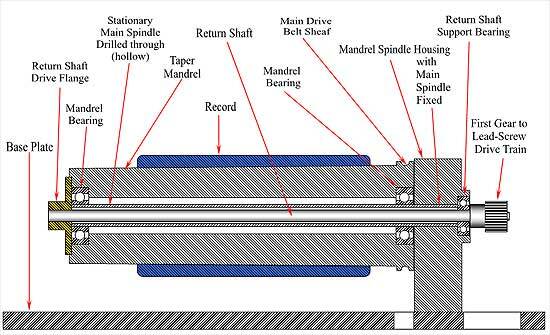 This means that from the record mandrel it needs a reduction ratio of 10 to 1. This is done from the mandrel spindle at 5 to 1 to an intermediate shaft and from there, 2 to 1 onto the lead screw. The lead screw then of course transfers the annular motion into a linear one via an engaging brass half-nut following the 200 gpi cut record. The spur gears I used were all cheap and cheerful acetate (plastic) apart from the first pinion one, which is of steel. The tooth counts, from the mandrel to the lead screw are 12 to 60 then 40 to 20; all are module 1. The pickup-housing-support-track is made using two 10 mm re-circulating ball, linear bearings. These bearings are very free running and relatively cheap for their technology (as are all ball bearings). The expensive bit is the corresponding hardened steel track rod. So to cut cost I used � 10mm stock ground (silver steel) rod that is plenty good enough for the reciprocating speed endured here. The ends of this shaft are turned down and set into two brass support blocks. These act as a hinge for when the pickup housing is lifted because linear bearings don't really like to be rotated. A short pillar goes up from the linear bearing unit to the pickup housing which bridges the record mandrel, then another and longer pillar goes down the other side to a brass half-nut that engages with the lead screw. The angle of the mandrel proved to be a problem. Not so much to manufacture but finding out what the angle actually is. 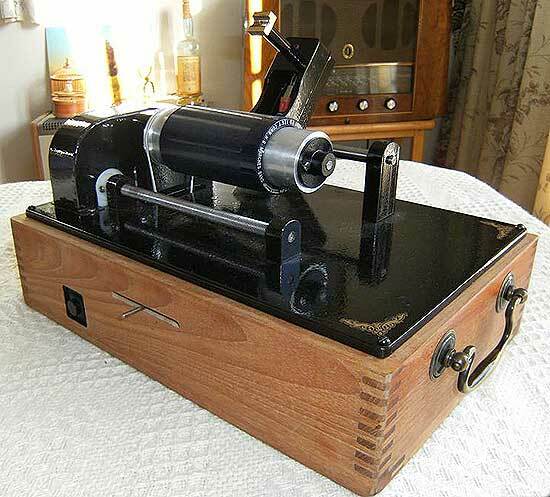 First I thought it would be a simple job of trawling through the various internet sites that are dedicated to phonographs and cylinder records� not a bit of it. It appears to be the one specification of the machine that everybody neglects to mention. Primarily I suspect because they have one and that's all they need to know about it. So I had to set about all the cylinders that I own with a pair of digital callipers by measuring the bore at each end and the effective distance between them, then trigging out a somewhere near angle. The Blue Amberols were not so easy to measure due to their plaster cores but luckily I have two Oxford (Indestructible) cylinders that have steel ring inserts at each end; these gave a more accurate and consistent measurement. The best that I could come up with was centre-line angle of 0.94 of a degree and this is what I first machined the mandrel to. However the cylinders tended to be a little loose at the title end of the record so I set it back up in the lathe and crept up on it by slowly reducing the angle a little at a time until I ended up somewhere between 0.6 and 0.75 degrees which gave a good cylinder fit. The mandrel is made from a length of � 60mm aluminium alloy (T6) and because an accurately made wheel will always run true on a dead-axle, even a skew-whiff one, I went for this style. The complication comes when you want rotation at both sides of the dead-axle's support block. Therefore the axle needs to be hollow and a return shaft passed through it. To drive the mandrel I scavenged a typical 12V D.C. turntable motor from an old belt drive 1970's Ferranti hi-fi deck. This motor I reduced 15 to 1 by retrofitting a light gearbox taken from one of those small motors units used to power radio-controlled vehicles etc. The accompanying motor was extremely rough and noisy but when the gearbox was married up with the turntable motor it ran smooth and quietly. This hybrid motor unit was even quieter when it was fitted onto rubber mounts beneath the base plate. A pulley wheel is fitted to the gearbox output shaft and an O ring belt runs through a slot in the base plate to the mandrel. The 160-rpm is adjusted using an old Lima model train-set speed controller. The cartridge that I chose was the magnetic Sanyo ST09D with a 78 sapphire stylus fitted. This was for no other reason than it was cheap and commercially available at �, and came with two 78 styli. The fixing of the cartridge unit inside the pickup housing I did by screwing it to a 0.10 mm feeler gauge finger that I dismantled from a cheap set and cut to length so that it has flexibility for any up and down movement of the record. As can be seen in the photos, the base plate is mounted onto an old mahogany box that once housed an old test instrument (long since removed). The player itself I powder coated gloss black and embellished it with a gold "Letraset" type transfer at each corner of the base to set it off. There is a simple on/off button to run the motor and the lever fitted to the model train-set controller adjusts the speed by about 10% each side of the 160 rpm. The player performs very well with a nice clean steady speed. If anything the reproduction is a bit sensitive and although the basic bass and treble on my stereo can be set to knock out much of the hisses and rumbles, it is a bit of a pay off at the expense of the actual recording. Therefore I would dearly like to run it through a graphic equaliser, which I don抰 have, but I think this will be my next step.